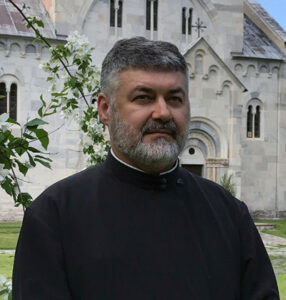 Protopresbyter Dobrivoje V. Milunovic was born on July 19, 1967 in Raska (Old Serbia), from father Vukomir and mother +Desimirka. When he was six years old, his family moved to the central part of Serbia, in the village of Vranesi, near Monastery Zica, where he finished elementary school. In September of 1983, he enrolled in St. Arsenius of Srem Seminary School in Sremski Karlovci. He received all of the highest honors and grades through his schooling and graduated in June of 1988. In September of 1988, he enrolled in the St. Sava Seminary School of Theology, in Libertyville, Illinois and graduated in June of 1992. In 2008, he earned a Master of Science in Education degree at the University of Wisconsin. On the feast of day of St. John Chrysostom, November 26, 1992, he was ordained a deacon at the St. Sava Monastery in Libertyville, Illinois by His Eminence Metropolitan Christopher. On the feast day of St. Andrew, the First-Called among the Apostles, December 13, 1992, His Eminence Metropolitan Christopher ordained him a presbyter at the Assumption of the Blessed Virgin Mary Church in Fair Oaks, California. During his priestly service in Fair Oaks, the church fresco project by the iconographer Miloje Milinkovic was completed. On the day of the consecration of the frescoes, his Grace Bishop Jovan elevated him to the rank of Protonamesnik. As a parish priest in Fair Oaks, he was instrumental in the introduction of the Stewardship Program and the establishment of the Endowment Fund of the parish. He dedicated a lot of time to the care of newcomers and refugees, following the civil war in the former Yugoslavia. In April of 1998, he published the Divine Liturgy and Prayers Service Book to more completely satisfy the needs of his parishioners. From September of 2002 until June of 2005, he served at the St. George Serbian Orthodox Church in Duluth, Minnesota. With God’s help, this small and vibrant parish was among the first in our Metropolitanate to adopt a Stewardship Program. An Endowment Fund was also established. From July 2005 through June of 2008, he served at the Cathedral Church of the Assumption of the Blessed Virgin Mary in Kragujevac, Serbia. Upon the invitation of His Eminence Metropolitan Christopher, in June of 2008, he was appointed a priest at the St. George Serbian Orthodox Church in Schererville, Indiana. Shortly after, he obtained a beautiful reliquary from Serbia, with the holy relics of thirteen saints. In 2011, prior to the Centennial Celebration of the parish, a Children’s Choir was formed. His Grace Bishop Longin elevated him to the rank of Protopresbyter. On November 14, 1992, he married Jelena Pejakovic. God blessed them with three children: Jovan, Marko, and Krstana. From his closet family, he has two brothers who are priests in Serbia (Ivanjica & Cacak), and an uncle who is a retired priest in Munich, Germany. His youngest uncle, who was a priest in Lyon, France, was killed in a car accident in 2005. However, his uncle’s son is now a priest in Vienna, Austria. In addition, he has a nephew who is a priest in Austria, and two other nephews are currently enrolled in schools of theology.